Everybody loves a convertible, and the Sporty Scratch n Shapes - Large Convertible will keep your cat happy and won't raise your insurance rates. Comes with a bag of Pure All-Natural Catnip. 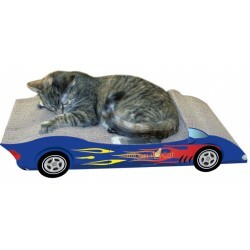 Everybody loves a convertible, and the Sporty Scratch n Shapes - Large Convertible will keep your cat happy and won't raise your insurance rates. This rugged scratching post is made in the USA from hearty, corrugated cardboard that's produced from recycled materials. Your cat will love scratching on this wide-bodied scratching post. Elegantly designed with sleek curves and contoured surface. Includes a bag of Pure All-Natural Catnip. Made in the USA. Measures approx. 23" W x 9" D x 5" H.